Instead of spending $7+ on those pore strips that you put on your nose, make your own! Take 1TBS of milk (whole milk, 2%, skim…it doesn’t matter) & 1TBS of unflavored jello & mix together. Place your jello & milk mixture in microwave for 10 secs & take it out. 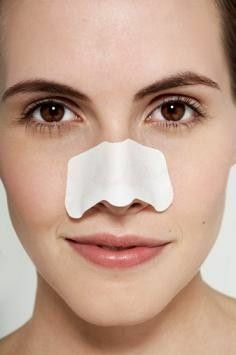 Take an old concealer brush and pick some of the mixture up onto the brush (make sure its cool) and brush onto nose in the shape of a pore strip (so go all over the nose). Once you have applied the mixture let it sit for about 10 mins. Once it has dried on your nose slowly, very slowly, peel the mixture off of your nose (it might sting just a tad). Now, look at what you have peeled off. If you see little black specks on the jello that means you have gotten off all of the dirt and oil build up in your pores on your nose. Toss the jello and now its time to wash your face. Make sure you pat dry your face and moisturize. Really make sure you moisturize your nose (dont’t worry if it is a little red…it will go away)!